Nowadays the importance of replacing common salt with healthier solutions is gaining more and more popularity. In fact, WHO State Members have agreed to reduce the global population's intake of salt by a relative 30% by 2025. According to WHO, reducing sodium intake significantly reduces systolic and diastolic blood pressure in both adults and children. In addition, high sodium intake has been associated with an increased risk of stroke, cardiovascular, coronary and renal diseases. Replacing salt is not a simple task. The final consumer expects the taste of reduced sodium products to be equal to, or at least similar to the conventional salt. In addition, most of the ingredients available on the market give undesirable residual flavors to food, like bitter or metallic taste. 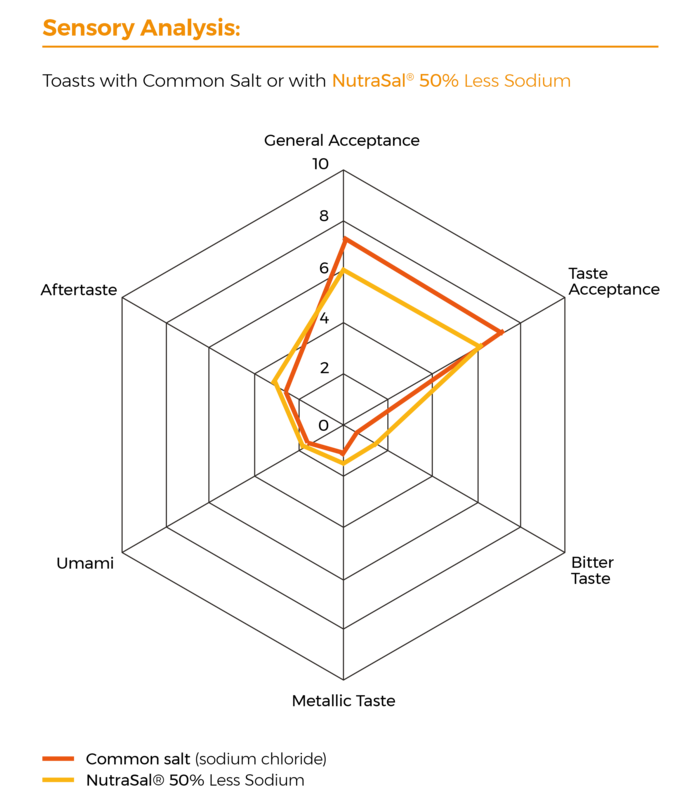 NutraSal line has been developed by Nutramax to serve the food industry with products that allow sodium reduction and replacement of common salt with no changes in taste. NutraSal substitutes have been formulated to preserve the sensory and technological functions of common salt in food, allowing partial or even total replacement. We count with two different references, NutraSal Zero Sodium, which doesn't contain sodium and NutraSal 50% less Sodium that contains 50% less sodium than common salt. NutraSal has a very intense and pleasant salty taste similar to common salt and can be used individually or together with other solutions available in the market. Moreover, NutraSal is able to block the perception of the bitter taste/ metallic residual taste of potassium chloride and can highlight not only the salty taste, but also the umami and the overall flavor of the final product. Nutramax organized a Sensory Test with 100 volunteers to test the sensory quality of NutraSal for which we prepared toasts with NutraSal 50% and toasts with common salt. The results showed that there was no significant difference in the overall acceptance regarding general taste, bitter, metallic, umami and residual taste.